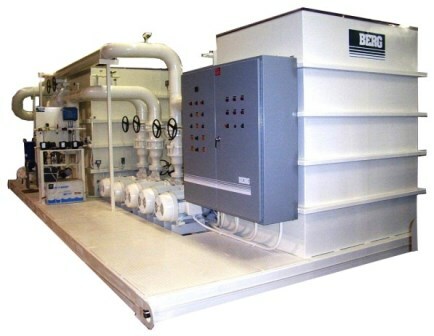 Industrial Clean Water Pumping Systems | Berg Chilling Systems Inc.
Made in Canada, Berg Chilling is located in Toronto. We have all components in stock for quick, reliable service. Berg has been recognized by the Canadian Government and awarded a Canadian Export Award , a measure of quality and service. Stainless Steel with steel tube tank bands (safety, longevity and aesthetics). Includes Stainless Steel Lid. All mounted on a steel square tube support. Process Pump on a valved discharge header assembly connected to a back-up pump (Reduced loss of production). Tower Pump connected to the valved discharge header assembly connected to the back-up pump (Reduced loss of production). Back-up Pump on Suction Manifold to both sides of tank. Central Control Panel with Visual and Audible Alarms. Follow Government Regulations for in-plant equipment. We confirm that all equipment will meet regulations such as the Operating Engineer’s Act of Ontario (where applicable), Energy Efficiency Act, B52 Refrigeration Code, Type-II Coordination, Ontario Hydro and CSA. We can recommended several water treatment options, including a chemical treatment system for controlling scale, corrosion and microbiological growth. Also as an option is a Y strainer, to be installed on the inlet of the tower side on the plate and frame heat exchanger, for large particle filtration in a full flow manner. 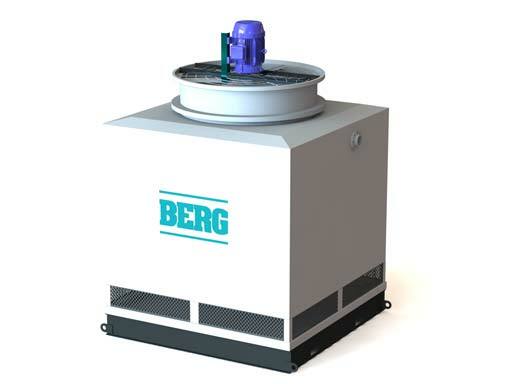 For fine particle filtration, we have recommended a Berg Centrifugal action, Fine Particle Filtration System, Model MLS-3 for SIDE FLOW sediment removal in the process water. As an alternative to the MLS filter, we have also the option of a Berg Sand and Gravel Filter. This unique system gives complete protection to water filtration. A side stream flow (approx. 5-10%) taken from the process main, is filtered and returned to the tank. When the water pressure drops to an indicated level, the secondary fine filter may be cleaned or changed. Filtration is achieved in two parts. The first is removal of large , dense particles (rust, sand, grit etc.) through internal flow patterns. Heavy particles settle to the bottom of the outer chamber where they are discharged by opening a bleed solenoid. Lighter solids are removed by the second stage, an inner chamber containing a stainless steel mesh strainer (standard 80 mesh). Lid is a clamp style for quick access to mesh strainer.